The Edith House Committee was honored to host Ms. Teresa Wynn Roseborough, executive vice president, general counsel, and corporate secretary for The Home Depot. Mrs. Roseborough attended the School of Law on April 9, 2014 and shared her insights as a woman in the judiciary and a woman in the law generally. Ms. Roseborough is responsible for all of Home Depot's legal functions worldwide ranging from securities to intellectual property in addition to overseeing the company's government relations and corporate security services. With more than 25 years of legal experience, Ms. Roseborough has also served as deputy general counsel for MetLife, deputy assistant attorney general for the U.S. Department of Justice and as a judicial clerk for Justice John Paul Stevens of the U.S. Supreme Court and Judge James Dickson Phillip of the U.S. Court of Appeals for the 4th Circuit. In 2009, the Network Journal named her one of the 25 Influential Black Women in Business, and she was named one of America's top black attorneys by Black Enterprise in 2000. 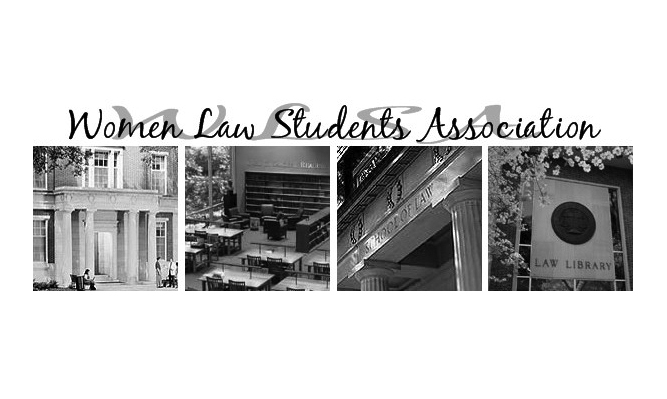 WLSA was pleased to cohost the Diversity on the Bench Event along with ACS, ALSA, and BLSA. Judge Carla Wong McMillian was appointed to the GA Court of Appeals by Gov. Nathan Deal on January 24, 2013. Born and raised in Augusta, Georgia, she is the first Asian Pacific American state appellate judge ever to be appointed in the Southeast. She is also a proud law dawg. U.S. Magistrate Judge Justin Anand was appointed to the U.S. Magistrate Court for the N.D. GA in Feb. 2012, at the age of 39. A graduate of Harvard Law, he previously worked as an associate at the Wall Street firm Cleary Gottlieb Steen & Hamilton. The Edith House Lecture Series in Law is named for Winder native, Ms. Edith House, co-valedictorian of the Class of 1925. Ms. House was one of the two women to graduate in the Class of 1925 – the first Class at the School of Law to graduate women. Ms. House practiced law for nearly forty years, retiring from her esteemed position as Assistant US Attorney for the Southern District of Florida in 1963. She lived in Jacksonville, Florida until her death in December 1987. The Edith House Lecture Series seeks to extol the memory of Ms. House by paying tribute to her accomplishments each year by bringing a female legal mind to the School of Law to speak on her experiences being a woman in the law. For more information, visit the law school's webpage dedicated to the Edith House Lecture Series. Thank you to everyone who participated in the 2014-2015 WLSA Elections. The next elections will be held in Spring 2015. Check back next semester for more details. The President leads the WLSA organization by identifying, creating, and planning events for WLSA members in coordination with the WLSA executive board. She serves as the primary representative of WLSA in events with law school administration and visitors from outside the university. The President leads executive board meetings and sets the agenda for board meetings. With assistance from other executive board members, the President prepares and sends the 1L incoming class mailing, collects membership forms as they are mailed in, and matches up incoming students with mentors. The President should be prepared to run full body meetings and to address questions from members, faculty, and non-law school contacts. The position of VP is an unelected position as the 2nd VP automatically ascends to this position during their 3L year. This position serves as the head of the Edith House Lecture Committee and will be primarily responsible for coordinating this event. The VP has the honor of selecting the Edith House Lecturer and will work closely with other members of the Edith House Committee to ensure that this event is a success. The 2nd VP is primarily responsible for helping the VP coordinate WLSA's biggest annual event, the Edith House lecture. As 2012 presents the 30th such lecture at the University, it is likely that the event will be bigger than in past years, so there will be a lot to do and to coordinate! If you would like to take part in honoring the legacy of the first female graduate from our Law School, and you are hard-working, committed, and creative, consider running for this position! You will work closely with the faculty and Dean White and will likely find this to be a fantastic networking opportunity. Please note that this position is only open to 2L students and it requires a 2 year commitment due to the fact that the 2nd VP automatically ascends to the VP position at the beginning of their 3L year. The Treasurer is responsible for maintaining the accounts of the organization. She will receive and deposit checks from members throughout the year, keep track of which members have paid their dues, and reimburse people for expenditures on behalf of the organization. The account records are maintained on an Excel spreadsheet, so please be familiar with that program or eager to learn. The treasurer is also responsible for hunting for other potential funding sources. Love of money and attention to detail are a must. The Secretary maintains records of the organization, including a membership list. The Secretary is also responsible for taking executive board meeting minutes and counting votes for any email elections or award selections. Should be detail-oriented, well organized, and prepared to perform basic data entry tasks. Computer skills are a must.